Prepare for the final assault on Windhelm by taking Fort Amol for the Imperials. Imperial Archers attacking a Stormcloak Soldier. Report for duty to Legate Rikke at the Eastmarch Imperial Camp. Join the Legion soldiers staging for the attack. Report for duty to Legate Rikke at the Eastmarch Imperial Camp, where she will give you orders to rendezvous with a group of Imperial soldiers preparing to attack Fort Amol and to assist in the assault. Make your way to Fort Amol and meet with the group of soldiers. As you approach the group, they will begin the assault. Assist your fellow soldiers in clearing the fort of Stormcloak rebels while the game updates you with the percentage of enemies remaining. The battle takes place in the exterior parts of the fort only, in the courtyard and on the walls. The entrance is blocked by wooden barricades, but these can be easily brought down by melee attacks. Once you have killed all Stormcloak rebels the quest will be completed and the Reunification of Skyrim questline will recommence. Occasionally you may be wrongly given a Stormcloak quest, The Battle for Fort Snowhawk. In this case, Imperial soldiers will not appear near the fort, making it impossible to join them. The fort is empty, making it impossible to take it. Although it may appear that necromancers took the fort before the battle, no necromancers appear either. Proceeding directly to Fort Amol and killing all of the Stormcloak soldiers there will not complete the quest either. When you go to Regain Eastmarch and you have to talk to Legate Rikke, sometimes you don't get the option to "Report for Duty". This disables you from continuing the quest until you can get that option. Sometimes when you go to Join the Men, you can't find them and they are not there. When you go to take Fort Amol, you can't find the Stormcloaks. This leads to the quest being unable to finish. 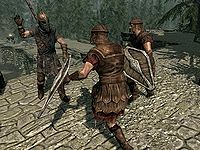 Use the command player.setstage CWFortSiegeFort 100 as it spawns the Stormcloaks and the Imperials, however make sure to do it at the Imperial rendezvous point, since the Stormcloaks will be hostile. Simply exiting conversation and talking to Legate Rikke again may offer the option. If Rikke offers dialogue other than "Report for duty", such as "Why did you join the Imperials" (or similar), select those conversations first. The "Report for duty" dialogue option may then appear. If a dragon attacks the Imperial Camp, this will cause all of the inhabitants (including Legate Rikke) to attack the dragon. After the dragon has been dispatched, the "Report for Duty" dialog option will appear. Conjuring an atronach in the middle of camp, then killing it may also fix this. Not Fast Traveling to Fort Amol, but walking to the location from another combined with a reduced inventory and confirming the presence of walking Stormcloaks and interacting with them (not attacking or killing until the battle) after the Battle of Fort Sungard, again before talking to General Tullius, again before talking to Legate Rikke to start the 'Battle of Fort Amol' quest and then walking to Fort Amol has resolved the disappearing soldiers issue for some. See talk page for other possible fixes. 10 Legate Rikke has sent me to assist in taking Fort Amol from the enemy. 9000 Finishes quest We have succeeded in taking Fort Amol from the enemy.